AURA SPRAY 15 is the perfect support for the energetic body. The spray cleanses and harmonizes your chakras and aura, restoring your energy field and rebalancing your energy flow. It makes you feel more energetic, more stable and connected with your inner strength. You can use AURA SPRAY 15 to cleanse both your body and your surroundings: your house, office, hotel room, holiday house, car, etc. 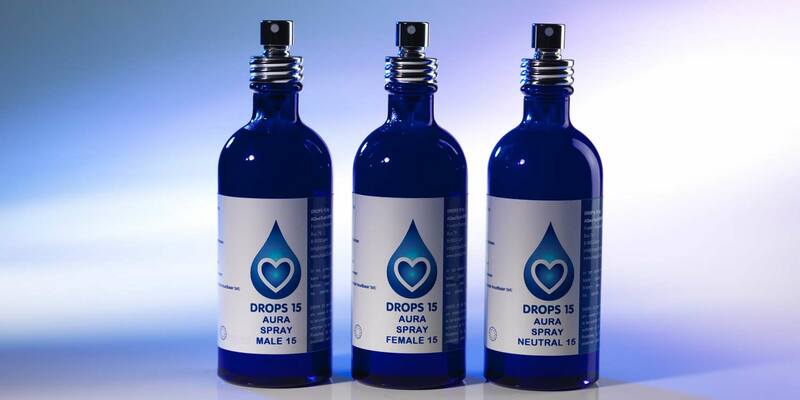 AURA SPRAY 15 is part of the DROPS 15 range. Its effect is based on quantum information which is programmed into the water by means of AQwaVit® AQwaVit® technology. AURA SPRAY FEMALE 15: The ‘female’ version of AURA SPRAY 15, with a subtle, warm and fruity fragrance of selected biological essential oils. AURA SPRAY MALE 15: The ‘male’ version of AURA SPRAY 15, with a subtle, fresh fragrance of selected biological essential oils. AURA SPRAY NEUTRAL 15: This fragrance-free version of AURA SPRAY 15 contains pure programmed water, with no added essential oils. How is the spray used? SSpray several times around the body and/or in the space you want to purify. Do this several times a day or as required. For external use only. Avoid contact with the eyes. Pure water with a selection of biological essential oils.